Physicians have recommended hormone replacement therapy to older individuals for many years. Usually the hormones replaced are the end-product hormones: testosterone or estrogen. Recent research suggests that there may be another way. By providing your body with the mother of hormones - Pregnenolone - one can let the body decide through its various feedback mechanisms which hormones it needs. If more DHEA is required supplemental pregnenolone will be converted to this hormone, and if estrogen or testosterone is in short supply, the pregnenolone molecule will be altered to produce the optimal amount of these. If your physiological requirement is a combination of hormones, then this too, can be achieved. By its very nature, pregnenolone works with your body to achieve optimal health and longevity. Pregnenolone’s many functions underscore its role as one of the most important hormones in the human body. Pregnenolone reduces fatigue and increases endurance. It also provides the brain with the hormonal and neurotransmitter support it needs to retard memory loss, thus helping to improve concentration and focus. Moreover, it helps those with arthritis, depression, and traumatic injuries. Although pregnenolone has long been overlooked because it is "upstream” on the hormone pathway, its many benefits to human health suggest that this vital hormone has just begun to receive the attention it so richly deserves. Dr. Raymond Peat (PhD Endocrine Physiologist) accidentally discovered the effects of pregnenolone when he took some vitamin E containing a residue of pregnenolone that was left over from an experiment in solubility. Peat had been suffering from a variety of complaints, including "inflammation of the arteries, dental abscesses, asthma, migraines, and colitis.” When he took the vitamin E containing some pregnenolone, he immediately felt better, but got sick again when he stopped. Suddenly remembering the presence of pregnenolone in the vitamin E, he crawled out of his sick bed, took a pinch of pure pregnenolone and felt immediately better. All of his symptoms gradually disappeared and in ten weeks, his appearance changed. Many aging characteristics, such as sagging skin, "chicken neck,” bags under the eyes, etc. receded. These changes were dramatically evidenced in a passport photo, taken one year before pregnenolone and 10 weeks after pregnenolone therapy was initiated. When I saw these startling photos, I fell off my chair, dashed to the phone and called Dr. Peat. Please see the further reading tab above for more in-depth information. One customer has reported adverse affects of Pregnenolone supplementation due to Oestrogen sensitivity. Clinical trials have not shown this to be a concern, however, for those with known Oestrogen sensitivity issues we would prefer that you err on the side of caution and therefore recommend very slowly introducing Pregnenolone; we would suggest starting at 1/5 of a capsules content daily and maintaining that level for two weeks before increasing to 1/4 daily and so on. Further, we would recommend a similar approach for those who are intending to use Pregnenolone alongside Oestrogen supplementation. Please do not hesitate to contact us with any queries or concerns. As the body’s supply of pregnenolone diminishes, so does the availability of its other related hormones. This has led scientists to consider pregnenolone supplementation as a way to turn back the clock on aging and counter the consequences of this dramatic drop in hormone levels. Discovered in 1940s, pregnenolone came into prominence only recently with its major stress and pain relieving properties for men and women suffering from different inflammatory and stress related conditions of the mind and body. Pregnenolone is one of the most effective and powerful and yet one of the most overlooked hormones with a multitude of different health benefits for both men and women. 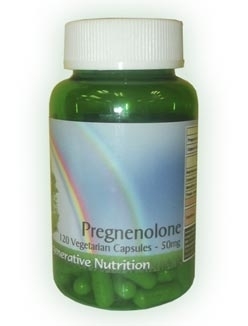 Pregnenolone is the source of the production of all other important steroid hormones in the body such as progesterone, DHEA, mineral corticoids (which regulate electrolyte balance), corticosteroids (which influence inflammation and metabolism), estrogens, and androgens. As pregnenolone is the precursor and controller of all these essential hormones in the body, it can be helpful in the treatment of a variety of conditions such as arthritis, cancer, osteoporosis, obesity, multiple sclerosis, premenstrual syndrome, and menopause. Pregnenolone thus offers great hope for men and women suffering from the above conditions of the mind and body. Other than these conditions, pregnenolone has also been found helpful in certain peculiar conditions affecting men and women. Pregnenolone interlinking role with other reproductive and steroid hormones in the body like DHEA, testosterone, progesterone and estrogen makes pregenelone benefits effective in treating various anti ageing conditions like menopause in women. Pregnenolone may be one of the most important hormones because it seems to have a balancing effect. It is a precursor to many other hormones and may be able to bring the levels of other hormones up or down as needed. Other benefits of pregnenolone may include stress reduction and increased resistance to the effects of stress, improvement of mood and energy, reduced symptoms of PMS and menopause, improved immunity, and repair of myelin sheaths. Pregnenolone also operates as a powerful neurosteroid in the brain, modulating the transmission of messages from neuron to neuron and strongly influencing learning and memory processes. As with DHEA, pregnenolone levels naturally peak during youth and begin a long, slow decline with age. By the age of 75 our bodies produce 60% less pregnenolone than the levels produced in our mid-thirties. For this reason pregnenolone is one of the biomarkers of aging. Like counting the rings of a tree, by measuring the level of pregnenolone at any given point of a person’s life, it is often possible to make an educated guess as to his or her age. Pregeneolone is not only the ultimate mother hormone for all the adrenal (cortex) hormones, it is also an important nutrient for optimal function and repair of the nervous system, this is why it is sometimes referred to as a neuro-hormone. The brain and spinal cord contain higher concentrations of pregnenolone than anywhere in the body. Supplementing with pregnenolone can considerably improve memory, problem solving, mental dexterity and mood, especially in stressful situations. Pregnenolone may help restore impaired memory, according to neurobiologist Eugene Roberts of the City of Hope Medical Center in Los Angeles, and his colleagues, biologists James F. Flood and John E. Morley, of the St. Louis VA Medical Center. These researchers tested pregnenolone and other hormones on mice. They found that pregnenolone is several hundred times more potent than any memory enhancer that has been tested before. Their report, in the March 1992 Proceedings of the National Academy of Sciences, says that pregnenolone restores normal levels of memory hormones which decline during aging. Pregnenolone; other benefits on mental and emotional function and accomplishing tasks. A study of aviators found that pregnenolone improved their functioning and perception of their work. Fourteen subjects took 50 mg of pregnenolone daily and performed tests with an automatic scoring device that operated like the joystick for a video game. Researchers found that the improvements the aviators experienced during the two weeks of administration had a cumulative effect that continued for several days afterward. In another experiment, 25-75 mg of pregnenolone were given daily to 8 leather cutters, 12 lathe operators, and 77 optical workers. While there was little benefit compared to placebo when the workers were not under pressure, productivity rose when the level of work-related stress was higher. Once again, the effect outlasted the length of the study. The subjects also felt that they tired less easily and were better able to cope with the demands of their jobs. No side effects were reported in any of these studies. in the book Pregnenolone: A Radical New Approach to Health, Longevity, and Emotional Well-Being, author Dr. Gary Young, N.D., points out that pregnenolone enhances mental performance, facilitates learning, helps the body adapt to stress, increases one’s overall feeling of happiness and well-being, and helps induce a change of attitude in which we actually become more appreciative of life. Relief of anxiety and panic attacks: A deficiency of pregnenolone turns on an anxiety-producing substance (endozepine), which triggers anxiety and panic attacks. The ‘mother’ hormone pregnenolone is produced from cholesterol, this is converted to DHEA and progesterone. Progesterone helps produce cortisol (hydrocortisone). DHEA converts to Androstenedione and this in turn can help produce both cortisol and testosterone, and eostrogen. The production of cortisone and other adrenal cortex hormones are mediated by the secretion of ACTH from the Pituitary gland in the centre of the brain. If this chain of events with its complex feedback mechanisms does not operate efficiently at any stage then hormone imbalance occurs, usually insufficiency. Therefore, the reasons for a DHEA, cortisol, testosterone or progesterone insufficiency can vary from person to person. Boosting the mother hormone pregnenolone can achieve raising of DHEA, cortisol, progesterone and testosterone levels sufficiently to overcome an insufficiency of those hormones. If all these hormones are raised to a level of a younger person great health benefits will ensue including a boost in well-being and general health into the older years and most likely, life extension. One may consider using pregnenolone instead of DHEA, however if you have identified a need for DHEA then whilst it is true that pregnenolone can help with overall adrenal integrity and balance of hormones in addition to the neuro hormone aspect it cannot guarantee production of the full amounts to restore youthful levels of DHEA, and so in these cases DHEA supplementation is still recommended alongside pregnenolone. As the effects of pregnenolone are balancing on the other hormones in the adrenal hormone tree and also as its direct effects and ‘knock on’ hormone effects are so wide ranging it is logical that it will take longer to see the full regeneration effects and health protective effects of pregenolone than it would with a specific hormone further down the hormone tree. For example; cortisol insufficiency due to adrenal fatigue will be relived in hours with the correct dose of bio-identical hydrocortisone (cortisol) but could be resolved more holistically with pregnenolone. However it could take months for the adrenal glands to be restored with pregnenolone to be able to produce adequate cortisol on demand. The fact that this can occur is exciting as it does indeed suggest that at least in some cases the entire adrenal hormone tree can be improved with just the use of pregnenolone. Individuals have reported fantastic health regeneration and apparent anti-aging effects. There is also evidence that the follow on hormones such as cortisol, testosterone, near the end of the hormonal tree have been boosted by pregnenolone supplementation. It seems apparent from the anecdotal reports that it is the higher doses of at least 50mg daily that have the most benefits in this area. Pregnenolone is able to reduce the activity of a receptor complex known as GABA. GABA is a neurotransmitter that literally cools the brain, protecting the nerve cells from burning out from all their activity. Too much GABA, however, can depress brain function, making the brain sluggish. By altering the extent of GABA-induced changes in membrane permeability, pregnenolone is able to reduce the increase in GABA transmission that occurs normally in older individuals. This counteracts the aging brain’s decline in mental sharpness. Pregnenolone also promotes greater growth of brain cells. A recent study revealed that pregnenolone counteracted the usual age-related decline in neurogenesis in the hippocampuses of rats. The researchers found a 55% increase in cell proliferation in the dentate gyrus, where newborn cells differentiate into neurons. This effect continued for several weeks after a single infusion, suggesting that long-lasting benefits could be achieved from ongoing supplementation. Of course, the more brain cells you have, the more memories you are likely to retain. An interesting article; Recharge With Pregnenolone by Dave Tuttle, discusses the role of pregneolone in counteracting depression, fighting fatigue and boosting memory. It further relates to help for spinal cord injuries and rheumatoid arthritis. Dr. William Regelson, a respected pregnenolone expert and author of The Superhormone Promise: Nature’s Antidote to Aging writes that there appears to be a direct correlation between pregnenolone levels in the human body and emotional well-being. He states, "A recent study conducted by the National Institutes of Mental Health showed that people with clinical depression have lower than normal amounts of pregnenolone in their cerebral spinal fluid (the fluid that literally bathes the brain)." In other words, as pregnenolone levels decline, your emotional well-being can also sink like a stone. In one human study, Dr. Eugene Roberts gave 20 Alzheimers patients 525 mg/day for three months with no toxicity. During rheumatoid arthritis experiments with pregnenolone, Dr. H. Freeman and colleagues gave 500 mg pregnenolone/day for up to 30 weeks, with no toxicity. And Drs. Pincus and Hoagland, two of the pioneer researchers on pregnenolone use by humans in the 1940s, found no toxic reactions with pregnenolone used by hundreds of men and women at dosages of 100 mg/day for four months. On an anecdotal note, there have been patients taking 100 - 1,000 mg (1gram) pregnenolone/day intermittently since 1987, with no discernible negative side effects. Levels of pregnenolone are much higher in the developing embryo and at various stages of childhood. As very large doses of pregnenolone have consistently proved to be non-toxic without side effects the body obviously uses what it needs and ignores any excess. This gives a rationale for doses that Peat used e.g. 100 mgs or more daily, so that maximum benefits can be obtained in health regeneration. Also the process of therapeutic regeneration using a variety of supplements and methods does have at times a stressful effect on the body e.g. via detoxification and it is during these times that the body is in need of the buffering anti-stress effects of pregnenolone and the hormones it helps to produce such as progesterone, cortisol and DHEA. The classic studies on pregnenolone and stress in the 1940s by Pincus and Hoagland generally used only 50 mg/day to achieve excellent results, while arthritis studies typically used 200-500 mg daily. For those wishing to err on the side of caution, 50 to 100 mg pregnenolone per day would probably be suitable for use without physician monitoring. Morning is the perfect time to take pregnenolone, and a single daily dose is probably best, since pregnenolone is fat-soluble, and probably follows the circadian highs and lows of DHEA and cortisol (highest in the morning, with a drop to baseline by late afternoon). Any nutritional supplement that improves the overall metabolic activity and efficiency to any significant degree is going to wake up the physiology. In this situation a multitude of nutrients are called into increasing play. If a person is deficient in electrolyte minerals especially and commonly unrefined salt (such as Celtic Ocean Sea Salt), and also dehydrated and not drinking enough pure water, there can be adaption difficulties that could result in stress or insomnia or even palpitations for example. It is wise to always take adequate unrefined salt (at least 6 gram daily) and typically a minimum of 2 litres of water daily. This will give the body the best buffer to adapt to the uprating of the entire system that will be engendered by taking pregenolone. For salt /water deficient individuals even a dose as low as 10 mg pregenolone daily could create a stressful adaption situation. Also individuals with adrenal fatigue or insufficiency, generally would be advised to supplement with Adrenal MAX Support (bio-identical hydrocortisone) first. The reason for this is that these individuals cannot tolerate much shifting into higher gear/ improved metabolic efficiency as cortisol /hydrocortisone in sufficient quantities is required to adapt to any significant change. Pregneolone will, over a sufficient period of time in some individuals (It may be most, we just don’t know at this stage) enable the adrenal glands to recover from a deficient state and produce the needed cortisol on demand, however this may take weeks or months and in the meantime the stimulation engendered may create adaption stress for those who are markedly adrenal incompetent as far as cortisone output is concerned. This may include aggravation of any pre-existent auto-immune disease. However, provided sufficient salt and water is taken even most adrenal fatigued subjects can adapt if starting at low doses e.g. 5 mg daily and gradually increasing the dose at a rate to suit the accommodation abilities of the individual, possibly aiming to reach at least 50 mg daily.